Ever taken on a job using multiple cameras, thinking that the shoot would be the tough part, only to sit at your computer to edit your video and feel dread creeping in as each footage file imports? Some longer shoots can involve clips from a handful of cameras, running at different times for different periods of time, and syncing footage for longer videos, such as events, can be extremely trying at the best of times. How about a music video, where you have five cameras from three locations and six takes of each song from each location? Have no fear, as Red Giant makes PluralEyes. PluralEyes is a tool designed specifically to alleviate that pain and make syncing your clips so easy that you can import, sync and edit in no time flat. In fact, PluralEyes is considered the fastest, most accurate audio/video sync tool on the market. It lives in Red Giant's popular Shooter Suite and is available as you read this. If you have an older version of PluralEyes, the update is free to current users. So, let's talk about how it works, and then go over what's new in the latest version of this cool piece of software. PluralEyes uses either the audio and video or audio portion of a selection of clips to put multiple clips in perfect sync. It can repair audio drift across clips, and it can work directly inside of Premiere Pro so you never have to leave to get your files synced up. PluralEyes closely analyzes your footage and then automatically uses the best possible sync options. All you have to do is hit the Sync button, and PluralEyes does all of that heavy lifting. Of course, applications like this are never without their faults. The best part of PluralEyes is that it recognizes its weaknesses and has brilliant built in tools to address those weaknesses. One of the coolest features is that you can watch as your footage is being synced, just like how your grandpa used to sit in a lawn chair to make sure the kid mowing the lawn didn't miss a spot. PluralEyes will show clips that may need attention in a different color right in your timeline, so you can investigate and address any issues. With applications like this, the ability to sync a lot of files is critical. Fortunately, PluralEyes has a feature called Smart Start which makes importing media easy. Simply drag and drop an entire folder of media into PluralEyes. The media not only imports, but when running your sync PluralEyes will automatically detect which camera or capture device each clip came from and it will sort them so footage from the same device appear on the same track in your timeline. We mentioned fixing audio drift. What is that, you say? Often in long clips, the audio track will lose sync over time with the video track. PluralEyes is unique in that it can detect drift, fix it, and export perfectly synced audio and video. There are options to choose between the original and repaired clips as well. To start, they've added support for users of EDIUS Pro. It's as simple as exporting a synced project directly from PluralEyes as an FCP 7 XML file into a recent version of EDIUS Pro (verion 7.5 or 8). Also new is a music video workflow. Like the scenario already mentioned, some shoots involve multiple clips. Well, music videos often have footage from multiple cameras, at multiple locations, and multiple takes of each track. This used to be a tricky sync job, but PluralEyes can consolidate all of the takes into their own track, muting everything except the master audio track. Tricky sync no more. Red Giant produced a video to show off the new music video workflow. The last couple of features are simple yet practical. PluralEyes now supports the spanning media from GoPro cameras. When shooting longer files many cameras will use multiple files or span across multiple memory cards and leave the job of re-attaching the files to editing or transcoding files. PluralEyes has been able to deal with this task for a while, but they've added support for spanning GoPro camera files. 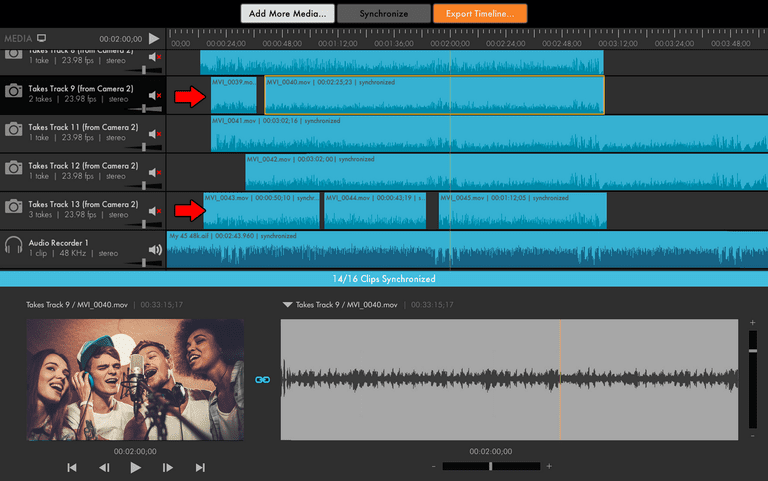 The final features are the ability to clean up synced projects by selecting multiple clips and deleting them before exporting the project to your editing software, and the option to turn drift correction on and off. Users of past versions of PluralEyes will be happy to note that Red Giant has addressed connectivity issues with the PluralEyes panel for Adobe Premiere Pro and resolved hangs when using PluralEyes panel for Adobe Premiere Pro during the “Sending media to PluralEyes” step. Current PluralEyes users can update the tool free through the Red Giant website or through Red Giant Link. For EDIUS Pro support, users must download through the Red Giant website installer. For additional help with updating to v4.1, please contact the Red Giant support team with any questions. New Red Giant PluralEyes customers can download a free trial or purchase the full version. PluralEyes 4.1 is available today as a standalone tool for $299 and as a part of the Red Giant Shooter Suite for $399. New users interested in PluralEyes are invited to download a free trial before purchase. Turn Your Phone into a Pro Studio!